I’d seen a demo of VMware and like many people I was blown away by the concept of VMotion. The company I was working for won a deal to build a VMware environment and P2V about 100 servers into it, so I positioned myself to get selected for the project. It was intense working with such a new technology, stuff broke and we had to work through a lot of problems. P2V’s were far more complex then as Converter didn’t exist yet so we spent many late nights swapping NICs and disk controllers around trying to get the right combinations of hardware that’d work with P2V Assistant or using Ghost. But the experience was invaluable, at the time P2V skills were rare so this opened up many opportunities for me. I remember where I was when I first heard of VCDX. It was described as the pinnacle of VMware certification and extremely difficult to obtain. The concept of defending before a panel sounded intimating but challenging at the same time, I knew immediately this was something I’d have to do! At the time I was working in a projects team, building VMware environments with little design experience so I knew I’d have to start working my way towards a design role. It depends when you measure it from. When I received my VCDX certification in 2012 I’d been working in IT for about 10 years, and each step along the whole process eventually got me here. I first heard about the certification in 2008 and decided I would go for it but the journey really started when I joined VMware in 2009, so it took about 3 years. Start with your end goal, VCDX and then figure out where on the scale you are now. Then create a plan to get there through a series of small, iterative but measurable steps. Figure out what you need to do and how you will do it. Secondly when it comes to submitting your design, read the blueprint. It is quite specific one what you need to cover. I was quite happy with my journey, really the only thing I would’ve changed is tried to get more of the documentation done during the actual project that I used in my submission. When I decided to submit I reviewed my design against the blueprint and noticed there were areas I needed to cover but weren’t a part of this design, so that meant a bit of extra work ensuring I’d covered off everything. 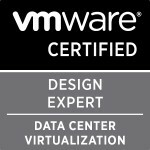 Before VCDX I was in the VMware Professional Services team for Australia & New Zealand which gave me the necessary experience to get the certification. My VCDX certification got me noticed by the right people in the company to get tapped on the shoulder to join the Global Professional Services Engineering team as a Solution Architect. Now I am responsible for creating the services that VMware Professional Services offer as well as being an escalation point for the field and interacting with our product teams. I am also now a VCDX panellist which I find very interesting seeing how people approach design problems. Categories: Certifications, VCDX, Virtualisation, VMware | Tags: Certifications, VCDX, VCDX5, VMware | Permalink.